Fresh from college with no prospects (marriage or job), Eugenia (“Skeeter”) Phelan returns to her parent’s comfortable home in Jackson, Mississippi. Skeeter desperately wants to break out of the roles that are expected of her – marriage, children, the country club – and become a writer. Aibileen, a black maid, has had 17 children, that is, she’s raised 17 white babies for the families she’s worked for. The loss of her own son while his white bosses looked the other way has caused her to view the world she’s always taken for granted and unchangeable with new eyes. Her best friend Minny is the best cook in the county but because she can’t hold her tongue and keeps mouthing off at her employers, she’s always looking for a new job. At home she struggles to raise her children and cope with an abusive husband. On the advice of a New York book editor, Skeeter decides to write about black domestics and their relationships with their white employers by talking first to Aibileen, then Minny. This turns out to be a dangerous project – it’s 1962, Jim Crow laws are in full effect in the Deep South and the Civil Rights movement is stirring up strong emotions. Skeeter is ostracized by her friends and Aibileen and Minny fear for their safety (Medgar Evers was gunned down in their neighborhood during this time) These three women, with so little in common, find themselves sharing their stories, their fears and their hopes. Together they create a grassroots change in their own homes and neighborhoods. 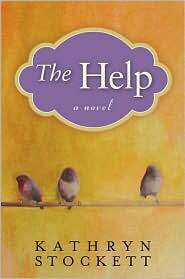 The Help is an amazing book with characters that you care for, authentic dialogue and a real sense of time and place. The tension builds as each woman puts herself at risk and there is sadness and hardship, but there is also friendship and laughter and hope for a better world.